“Bold Block – Fisherperson”, “Bold Block – Sail Boat”, “Bold Block – Heron”, “Bold Block – Fishing Fly” and “Bold Block – Hummingbird” are stamped on five different colors of Bazzill card stock, cut out and adhered to white card stock. The black and white strip on the left is May Arts ribbon glued to the card. 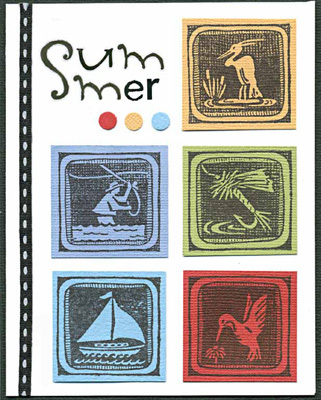 The word, “Summer” is made with alphabet stickers by Creative Imaginations. Three coordinating colored punched circles are adhered below the word, “Summer”. Card by Danielle Côté. Stamps embossed in gold on dark green confetti card are “Spinner”, and “Creel, Sm.” which is edged with a gold Krylon Leafing pen. 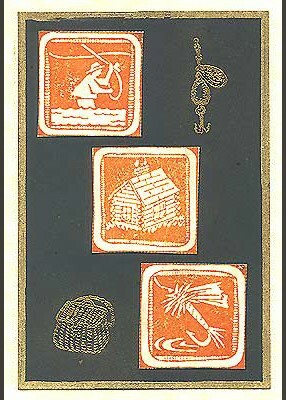 “Bold Block – Cabin”, “Bold Block – Fisherperson” and “Bold Block – Fishing Fly” are stamped in light brown on ivory card stock, cut out and mounted on the dark green confetti card stock. The card is then layered on ivory parchment card stock. Card by Mary Hansen.